Photo from Spindrift, 1960 ed. 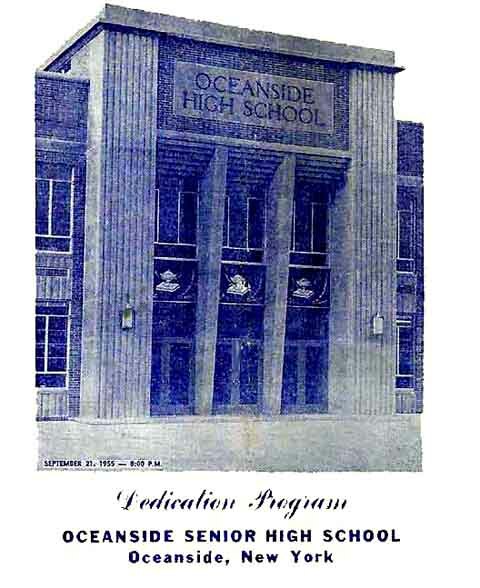 As we continue our technological time travel, our cyber- , if you will, and move from life in America and life in its suburbs, in general, when we were growing up, we now drop anchor in port Oceanside and zero in on life in the halls, classrooms and other areas of our own Oceanside High School. OHS was, in fact, the center of our world for three years. (It seems like a blink now, but back then, it didn't.) In those three years, we were molded, sheltered and nurtured together until graduation day in 1960, when we were finally cast out in every direction to make it on our own, like birds leaving the nest. Photo from Spindrift, 1962 ed. A typical class in session. 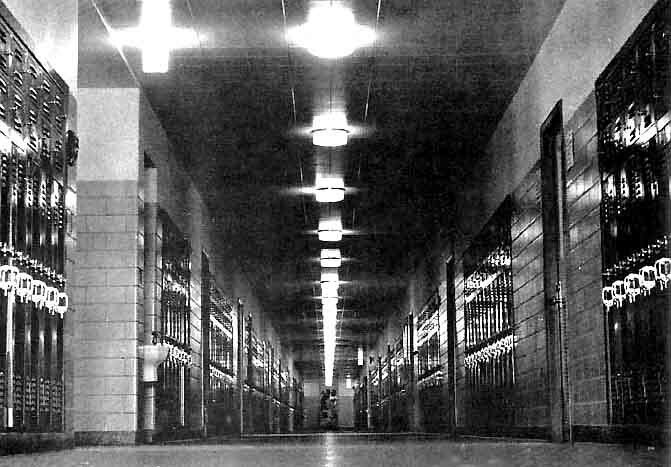 Photo from Spindrift, 1959 ed. How many classmates can you name? 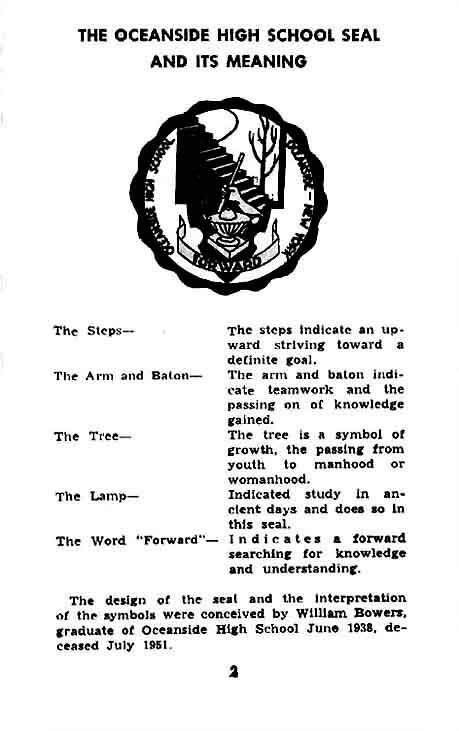 Cover of our school's dedication ceremony program booklet, September 21, 1955. Notice the artful detail above the entrance, three relief sculptures of a lamp set upon a book, each an ancient symbol of learning that also appears in our school seal, immediately below. Only two of these sculptures now survive and are relegated to a closed courtyard. Click here for more from the dedication ceremony program booklet. 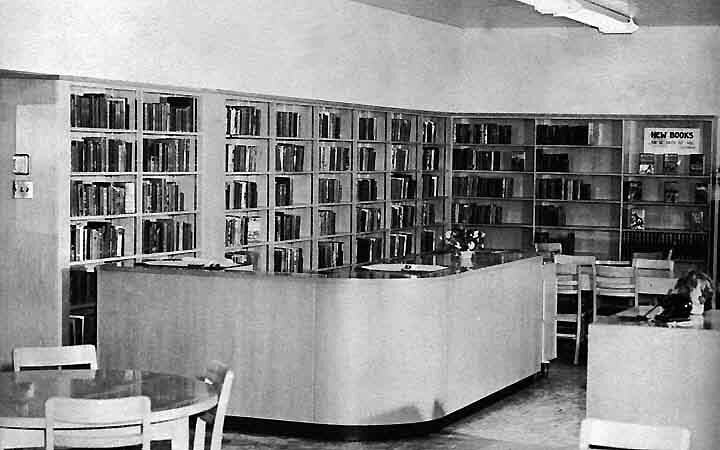 Our library when it first opened in the 1955-'56 school year Photo from Spindrift, 1956 ed. Can you still see that prissy little Miss Morrissey behind the desk? 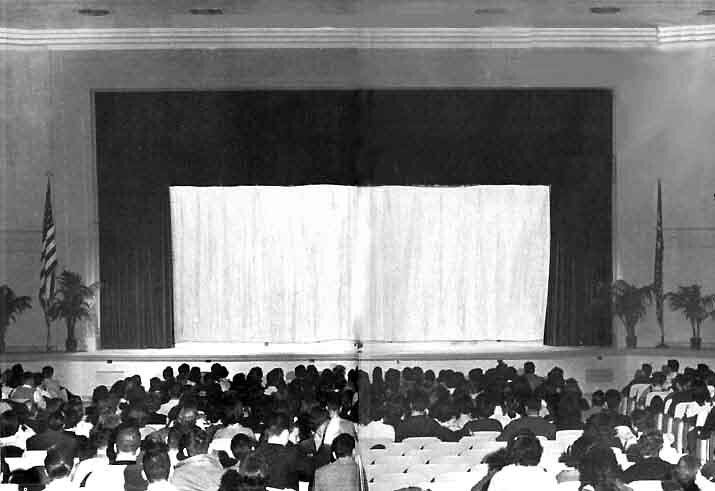 Our auditorium during the first school year (1955-'56) in the then brand new building Photo from Spindrift, 1956 ed. Click here for more cool stuff from the Sailor's Handbook. Do you remember what time our school days were over every day, when the last bell rang, and "you finally lay your burden down"? 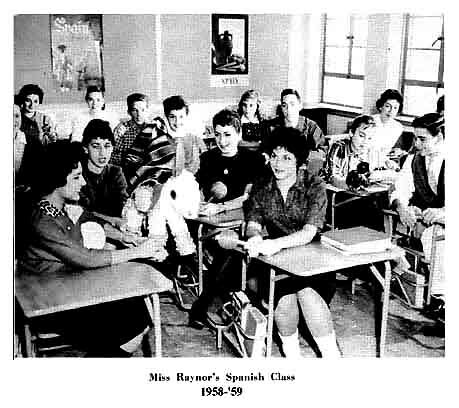 So besides studying "American history and practical math" and otherwise getting a first-rate formal education, what went on from 1957 to 1960 in those classrooms and hallowed halls (while we were racing around to get from one class to the next in only three minutes)? High school was for us, as it is for all kids, much more than just an education. In fact, the education can almost be viewed as secondary. 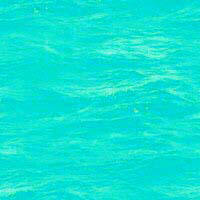 It was a daily social event of incredible importance. 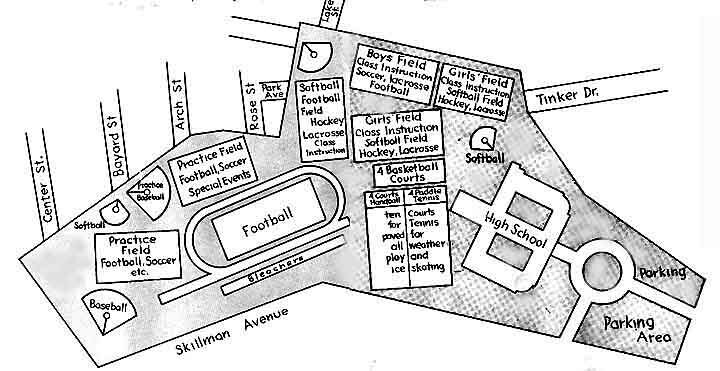 No matter what else we did outside of school, for those years, it was, in fact, the epicenter of our young lives. On the pages linked below, you can revisit the rich array of sports, theater arts, music and other extracurricular program activities that we availed ourselves of, programs that taught us teamwork, leadership, sportsmanship, community service and a host of practical skills to prepare us for the real world, and that filled our school days and kept us off the streets of our little town, and of the others nearby that were just like it. And if that wasn’t enough, we had sororities, fraternities and what were called "social" or "social and athletic" clubs to strengthen our bonds of friendship for our lifetimes ― and many of us also held jobs after school.